Hurray! It’s Perfect Picture Book Friday! And today’s Perfect Picture Book is one of my all time favorites. (So is next week’s and really I wish I could have put them both up in one day but all in good time…!) Assuming even 9 people besides me post books today, our archive list will be over 100 books already – isn’t that great?! It’s becoming a real resource! 🙂 Thanks SO MUCH to everyone who is participating! 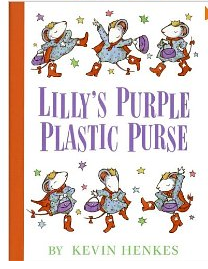 Brief Synopsis: (From Amazon.com Review) Lilly loves everything about school, especially her teacher, Mr. Slinger–until he takes away her musical purse because she can’t stop playing with it in class. Lilly decides to get revenge with a nasty drawing of “Big Fat Mean Mr. Stealing Teacher!” but when she finds the kind note he put in her purse, she’s filled with remorse and has to find a way to make things right again. Why I Like This Book: Kevin Henkes perfectly captures the excitement of having something new and treasured to share with friends and the overwhelming difficulty of staying within the rules on such an occasion. Lilly’s exuberance feels so perfectly real. Without preaching or moralizing this story shows the importance of behaving properly, that actions have consequences, and that it is within a child’s own power to correct a mistake – that just because she didn’t handle a situation quite right the first time doesn’t mean she can’t do it better tomorrow. First, the results of the contest poll have shown conclusively that you are inconclusive 🙂 Only “No thank you I’m too busy” got only 1 vote 🙂 Since everything else was pretty evenly split across the options, including the easy-going types who were willing to do whatever worked for everyone else, I think we’ll do a contest every 2nd or 3rd month. We’ll skip January to give everyone a rest, and then do one in February (Groundhog Day and Valentine’s Day leap instantly to mind :)) and see where we go from there. Sound good? Thanks for sharing – I have not read this one myself! I love the sound of this book. It sounds like a great one for kids – great message but not too preachy. Thanks, Katy! I'm glad you like it. I'm going to have to rush right over and see your blog – I love the idea of YA books beyond bestsellers!